Cameron Anthony Miller Does It Again! It was at the University of Arkansas indoor facility on a January afternoon when Dallas Bishop Dunne stand out Cameron Anthony Miller showed how special of a senior season he intended to have. On that day, he ran two elite times including a national leading time in the 200m. Miller would run 21.11 in the prelims to make a statement and then doubled back in the finals with another 21 low with a 21.15. About a month later, he would once again run a 21 low. This time, he was at the University of Kentucky and he would drop a 21.14 to show his consistency. This outdoor season, Miller continued to dazzle and drop some impressive times. Competing mostly in the 100m and 200m, his speed would produce a 10.35 PR in the 100m along with a 10.4 and a 10.48w. In the 200m, he would go as fast as 21.06 (another PR) and 20.98w. This weekend, Miller was right back at it as he now sits atop the national rankings once again, this time it was for the current outdoor season. At the TAPPS 6A District 02, the clock would read 20.56 moving him to that top spot. 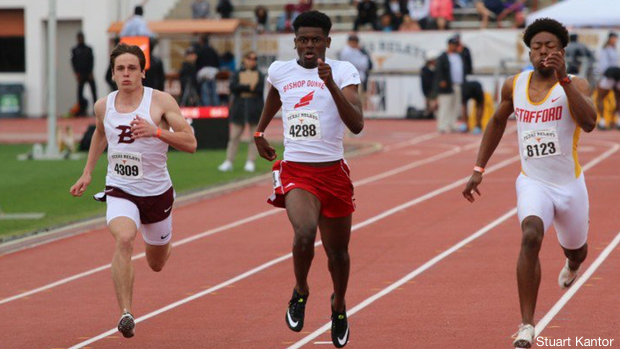 With the post season looming, Miller could end up repeating as the TAPPS 6A 200m state champion and possibly more at national post season meets. We'll see if he could finish this outdoor season as the nation's #1 200m runner like he did for the indoor season.